K-pop artists managed by leading Korean entertainment agency S.M. Entertainment kicked off their sixth concert tour around the globe in Seoul on Saturday. 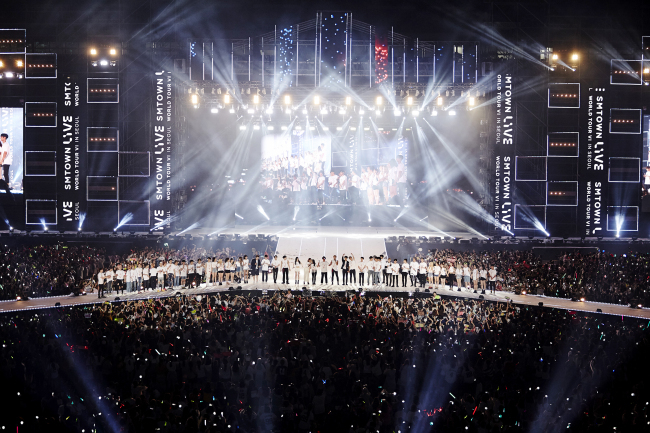 A total of 61 singers thrilled some 45,000 fans at the SM Town Live World Tour VI concert at Seoul World Cup Stadium. It was the first SM Town Live concert in Seoul in three years since its fourth tour opened in the city in August 2014. The star-studded lineup for the concert included BoA, Super Junior, Girls’ Generation, EXO, f(x), SHINee, NCT127 and Red Velvet. The artists performed their hit songs and collaborated with each other to perform legendary K-pop singers’ tracks. At the concert, BoA unveiled her latest track “CAMO” while Yunho of TVXQ -- widely known as his stage name U-know -- returned on stage for the first time since he heralded his comeback in April ending mandatory military service. The concert tour will now head to Japan to perform at Kyocera Dome in Osaka on July 15-16 and at Tokyo Dome on July 27-28. Since 2008, artists signed by SM have performed in major cities around the world such as Seoul, Los Angeles, New York, Paris, Tokyo, Beijing and Shanghai.